Plus-size lines are hard to find in malls and shopping centers across America. 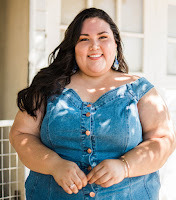 Aside from Lane Bryant, Torrid, and select plus-size sections, anything beyond a size large is rarely seen or admired. Forever 21 hopes to change that. 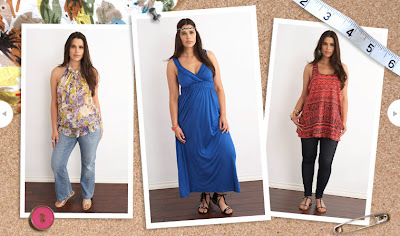 On May 1st, Forever 21 will debut Faith 21, a junior's plus-size line, in select stores and online at Forever21.com. Faith 21 promises to deliver trendy clothes in junior plus sizes. A lookbook is available for viewing on Forever 21's official website. From what I've seen thus far, it seems like the line will not disappoint. I'm very happy that a retailer with such popularity and mass availability is offering plus-size apparel for young girls. They are getting a chance I did not have while in my teens. In high school my shopping was limited to Lane Bryant and -- well, more Lane Bryant. Don't get me wrong, I love Lane Bryant. They cater to my style and have a fabulous selection of clothes. Growing up, however, I was embarrased to shop there. Immediately after exiting Lane Bryant I would hand the shopping bag over to my mom or dad. That embarrassment came out of sadness that I couldn't be "normal" and shop at stores every other girl could. The last time I stepped into F21 was about five years ago with a friend of mine. She was having a blast trying on clothes while I browsed at the accessories. She encouraged me to find something so I began looking through the racks, attempting to fool myself and others into believing the piece of clothing I admired could actually fit me. I did so well at deceiving myself that I left F21 with a new red blouse. The blouse didn't fit me but the pride I got from holding that yellow bag was tremendous. I felt normal, even if it was just for an afternoon. I want teen girls to feel that way every day and every where they shop. Hopefully Faith 21 will do just that. The stuff looks really cute. Loving your new header too btw! That's great! F21 is a great place with reasonable prices. That makes me happy to hear that they're catering to all shapes and sizes! :) I remember shopping at certain places and the only sizes that they'd have on the rack is 0, 1, and 2...come on! Bigger girls deserve to wear cute trendy clothes too! thank you so much for commenting on my blog. I do think that this is great. I am so excited about this. im really exicted about this line too, i hope more stores will follow forever 21 lead and realize not all of us are skinny girls like they want to believe. This is an awesome post. You know I like Faith 21 It's a good follow up on developments with this line. wow, I had no idea about this--thanks for sharing, doll! By the way, Amanda your so pretty girl, you should model. I so think you should. also, thanks for commenting on my blog! Yeah they need to do something because Their larges are NOT large at all. My Breasts dont fit in their button down blouses, and jeans???? FUGHETTABOUT IT! @ Leah - Thank you so much! I appreciate that! @ JGeb - I love the new header, too ;) Thanks for noticing! @ Jen - Bigger girls do deserve to wear trendy clothes too. Amen! @ Fashion Without Guilt - I'm excited too. Also, thanks for linking me on your blog! @ Tanya - You're welcome! @ Super Woman - LMAO. You are always so damn entertaining girl! I tried to update a game on my iphone through the update section of the app store. I got a message that said the update must be done through wifi or iTunes. I logged into my iTunes account, but was clueless on where to go. What am I supposed to do?